Where We Stand - More Moguls! all share the bohemian spirit that embodies most of the Old Bradford neighborhood. South Side of Old Bradford. institutions of Titan City. One of the first you will see is the Vrghr King novelty restaurant. classic wolf and crown neon sign that has been lighting up Titan City’s beach boardwalk since the 1960’s. on a half-pound wolf burger, chili fries, and hush puppy Southern Specials - no actual wolf meat is used! parlour where Tazi and friends hang out before hitting the streets! go to get their next tattoo! speedsters, but also ADA compliant. border. This art deco institution has been a fan favorite in Titan City since the Silver Age of comics! We shared BLOK Comics with you in January, but now you know where on the map to find your favorite comics in Titan City! the lake you will see part of the structure floating in the gardens. Hidden in the structure will be a secret, underwater lair! This brutalist concrete architecture will be overflowing with plants and make for an extraordinary secret discovery spot to explore! with an amazing dance club. throughout the year at this beloved venue. dancing on the tower rooftops, ask them if you can get a VIP pass from Wicked to come join the party! Heading to the far west side of Old Bradford you will find another important Titan City institution: The Timetable club. signature seahorse sculptures out front, reminiscent of the old Titan City boardwalk style. text and characters tend to limit the feeling that you are playing something with real life, history and character. City as a unique place that supercharges all of our imagination! forward to making lots of progress on our additional Mogul buildings in 2019! *** Important reminder about the pictures above - these 3D models have been made in software independent of the game environment. 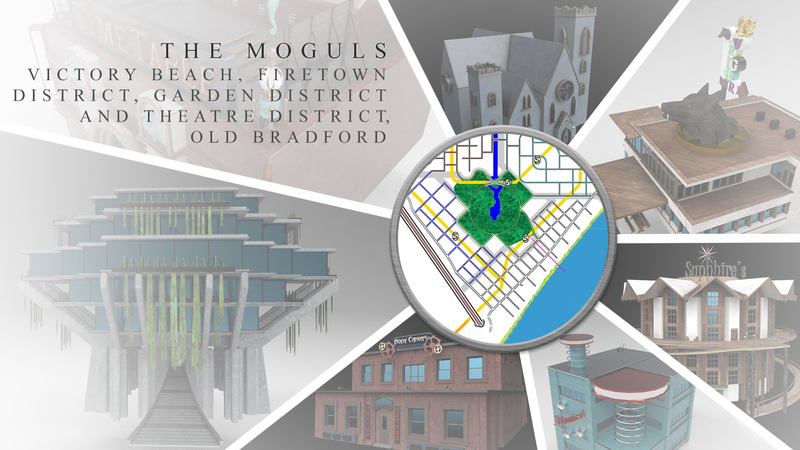 Thanks go out again to Master Builder Nathan Purkiss, City Designer Carol Kirk, and all of our Mogul Backers for their excellent imaginations.